Fetch is a game where you throw a toy (think a flying disc or some other favorite toy) for your dog. Your canine companion is then supposed to chase after the toy, pick it up and bring it right back to you. The game doesn’t involve your dog running off with the toy or running off and expecting you to chase after him and the toy! The game typically needs to be taught in stages, so your dog learns how to play correctly. As you can see, the equipment necessary is pretty basic. However, your dog will also have to know how to sit (when told), stay, the drop (or leave it) cue and understand the release cue. Ideally, these will have been taught previously, so you and your dog are ready to jump into learning fetch! Now you and your fur baby are ready to learn how to fetch! You’re both learning this game, by the way. You have to learn how to properly teach your pet and he has to learn how to properly perform and play the game! 1). Work in a quiet area: hopefully you’ve already chosen the best area to work with your dog. Ideally, this should be an enclosed area with few distractions. You want your dog to focus on learning, not be distracted by everything going on around him. Your backyard might be an excellent place to hold fetch school. 2). Have your dog sit: have your fur baby sit near you and tell him to stay. Give him praise and a treat for good behavior if he’s still learning to sit and stay. 3). Show the toy: once your pup is sitting and staying calmly, show him the toy—in a calm manner. You don’t want to get him so excited that he breaks from the sitting position. 4). Let your dog smell the toy: this will gain his interest but be sure he stays sitting and calmly smells the toy! Again, the goal is to keep him sitting until you tell him to chase the toy and bring it back. 5). Throw the toy: next, throw the toy and give the cue for him to fetch it back. This is the tricky part. Most dogs will chase the toy and then run off with it. You want him to bring it back. So, when your pup brings the toy back to you, give him the cue to drop (or leave it). When he does this correctly, reward him with praise and a treat. 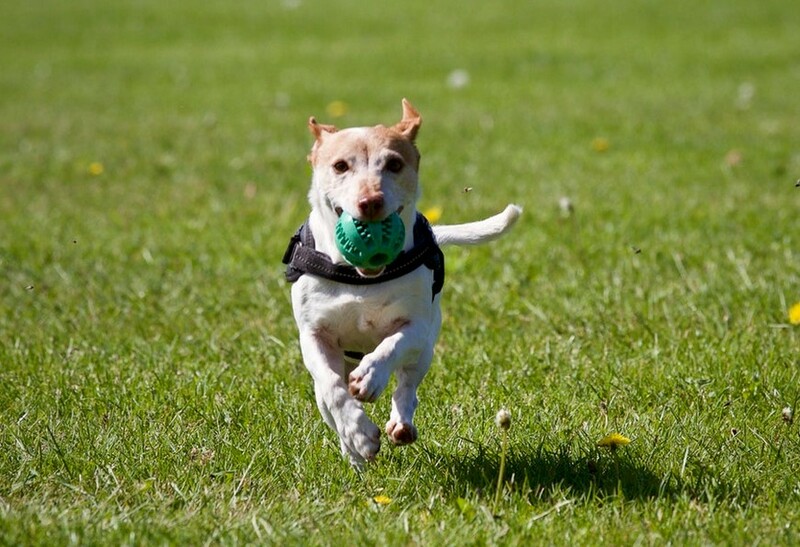 You’ll likely have to repeat steps 1-5 several times before your dog understands the game. Be patient—all dogs learn at their own pace. Repetition is OK and staying calm as your dog learns is a must. You may even have to repeat fetch training over several days or weeks. That’s also OK, too. Make this a fun exercise for your dog, rather than a job. The more fun he has, the faster he may learn! As you repeat this exercise, be sure to follow the same steps each time. This will help your dog learn as you go. Also remember to offer him praise and a treat; however, as he gets better at understanding, you’ll want to wean him off the treats as a reward. Praise and the fun will be all the reward he’ll need at that point! Have fun and enjoy this new game with your fur baby!